Turkey's President Recep Tayyip Erdogan, addressing his supporters in Istanbul, announced his manifesto for the upcoming snap elections in the country, which are due to be held next month. In the wake of Ankara's Olive Branch Operation, the military offensive in the Kurdish enclave of Afrin in northern Syria, Erdogan promised new Turkish missions in the country. "We will not give up on constricting terrorist organisations. We will add to the Euphrates Shield and Olive Branch operations. Our soldiers are ready for new missions," the president said. By late March, the Kurdish-dominated Syrian city of Afrin was fully captured by Turkish military forces; however, Erdogan stated that the advance would not end with the capture of Afrin, noting that the regions of Manbij and Idlib would be the next targets. Ankara launched an operation code-named Olive Branch in January, aiming to clear Turkey's Syrian border of Kurdish groups, which it believes to be linked to the Kurdistan Workers' Party (PKK), listed as a terrorist organization by Ankara. 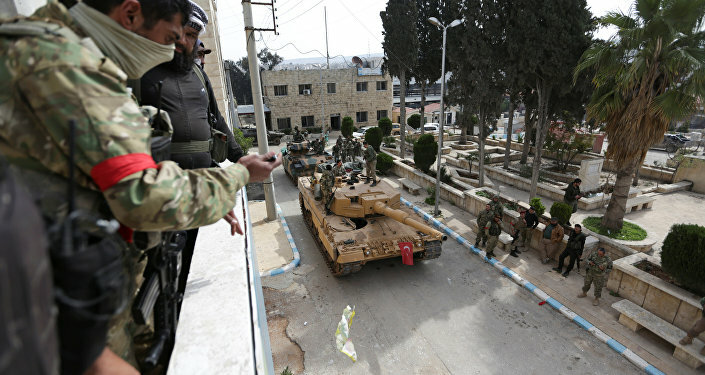 The offensive in Afrin was launched after Ankara ended its seven-month Euphrates Shield military campaign in the province of Aleppo in March 2017. Euphrates Shield was Ankara's first direct military intervention in Syria; the objective was to push Daesh militants away from the Turkish border as well as prevent the advance of local Kurdish groups. Erdogan pointed out that Turkey had never abandoned its goal of joining the European Union, unlike the country's European counterparts which did not appear to show the same determination on the issue. Turkey began negotiations on entering the bloc in 2005, 18 years after the country first submitted a membership application. The talks on Turkish EU membership have been repeatedly suspended due to the Cyprus dispute and the resistance of Germany and France, among other obstacles. In March 2016, the bloc and Ankara agreed on a deal, under which Turkey vowed to accept all undocumented migrants who arrive in the EU through its territory in exchange for Syrian refugees accommodated in Turkey, on a one-for-one basis. The Union promised to accelerate the Turkish EU accession bid, introduce a visa-free regime, as well as provide financial aid to Turkey to cover the costs of taking in asylum-seekers.